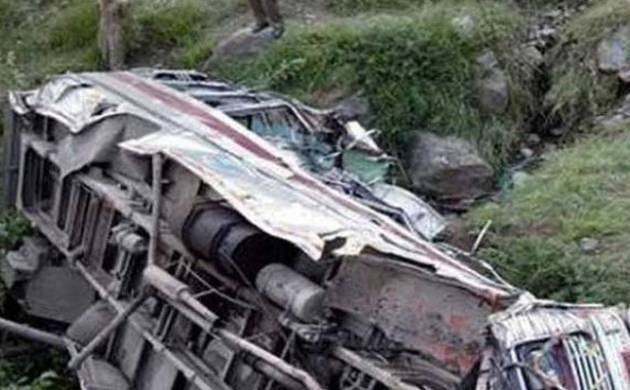 At least 25 people were killed and 11 others critically injured when a bus carrying artists of an opera troupe fell into a gorge in Deogarh district of Odisha this evening, the police said. The bus with around 40 members of the troupe including women and children, was returning to Remta in Bargarh district from Deogarh when it plunged more than 250 feet down in the hilly Tilaebani Gaelo ghat, they said. “Twenty-five bodies have so far been been recovered and 11 injured persons, who are in a critical condition, rescued from the mishap site,” Deogarh Superintendent of Police Sarah Sharma, who rushed to the site, told PTI over phone. She said rescue operation was launched by fire brigade and police personnel and some of the injured persons were rushed to Deogarh hospital for treatment. Generators were pressed into service to facilitate rescue operations in the dark, while senior police and administrative officials have also rushed to the spot to supervise the operations, Sharma said. Difficult hilly terrain, dense forest cover and low visibility were hampering rescue operations at the mishap site, the SP said. The accident took place when the driver was trying to negotiate a sharp turn, she added.